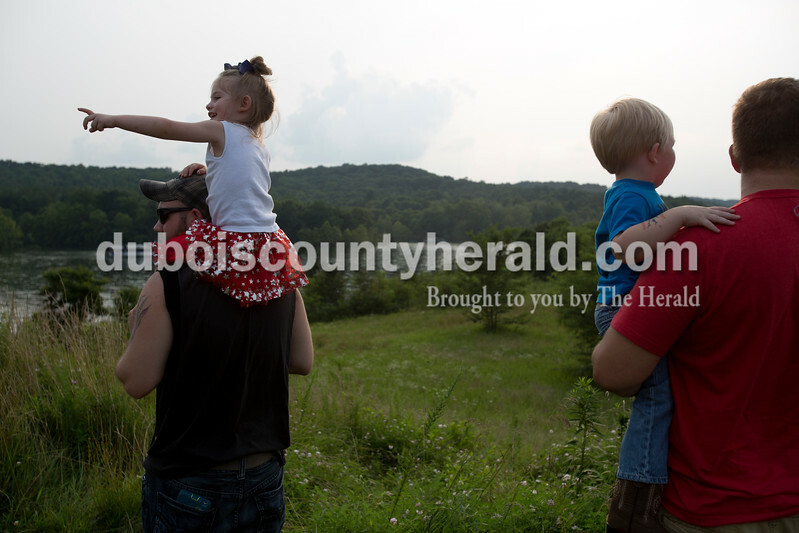 Andrew Miller of Dale held his daughter Jayla Miller of Dale, 3, left, on his shoulders next to Ryan Stalcup of Petersburg who held his son Cooper Stalcup of Petersburg, 3, right, while they waited for the fireworks to start on Saturday evening at Patoka Lake for Thunder Over Patoka. Since the beach at Patoka Lake flooded, everyone was relocated to a higher parking lot. 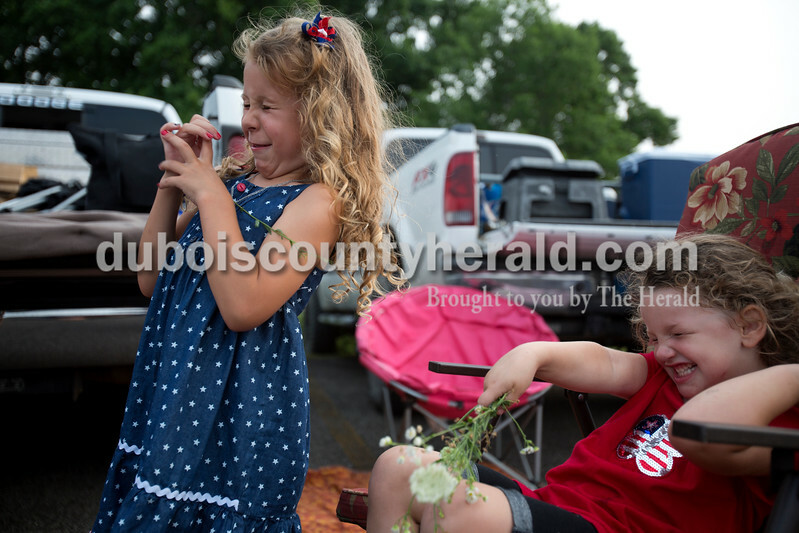 Aryssa Schipp of Jasper, 5, left, reacted to flowers being thrown in her face with her friend Lexus Griffith of Dubois, 3, right, on Saturday evening at Patoka Lake while they waited for Thunder Over Patoka. Since the beach at Patoka Lake flooded, everyone was relocated to a higher parking lot. 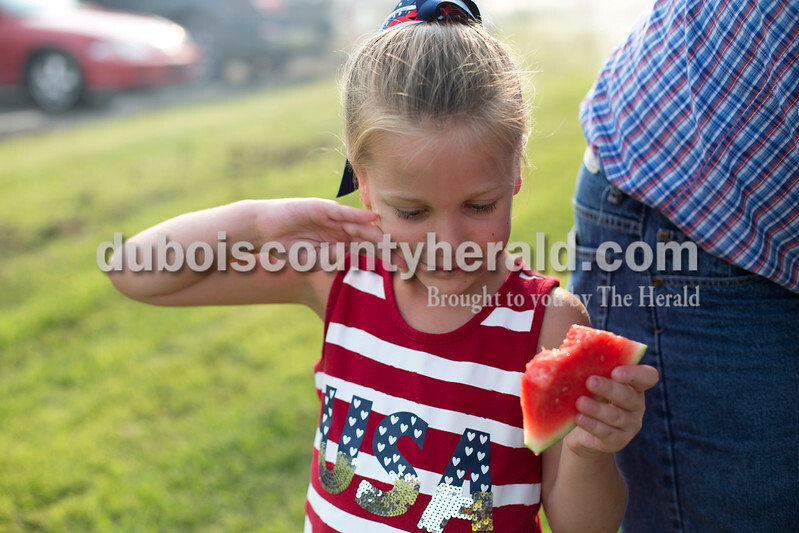 Aubrey Ashwill of Veedersburg, 6, wiped the watermelon juice off of her face on Saturday evening at Patoka Lake for Thunder Over Patoka. Since the beach at Patoka Lake flooded, everyone was relocated to a higher parking lot. 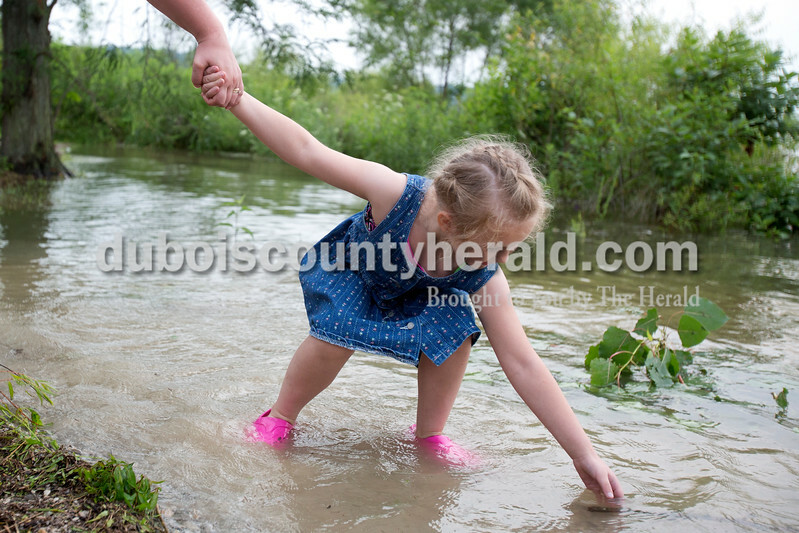 Stacy Merkley of Cannelton held the hand of her niece April Johnson of Cannelton, 6, while she reached for a stick in the water of the flooded parking lot next to the beach at Patoka Lake on Saturday evening for Thunder over Patoka. Since the beach at Patoka Lake flooded, everyone was relocated to a higher parking lot. 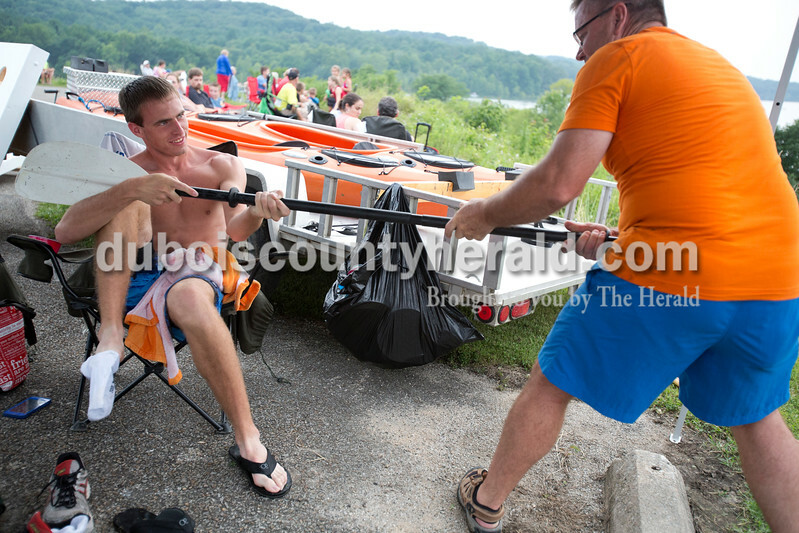 Jason Buechlein of Jasper, left, helped Steve Wigand of Jasper take apart a paddle from Wigand's kayak so they could put everything away before the fireworks on Saturday evening at Patoka Lake for Thunder Over Patoka. 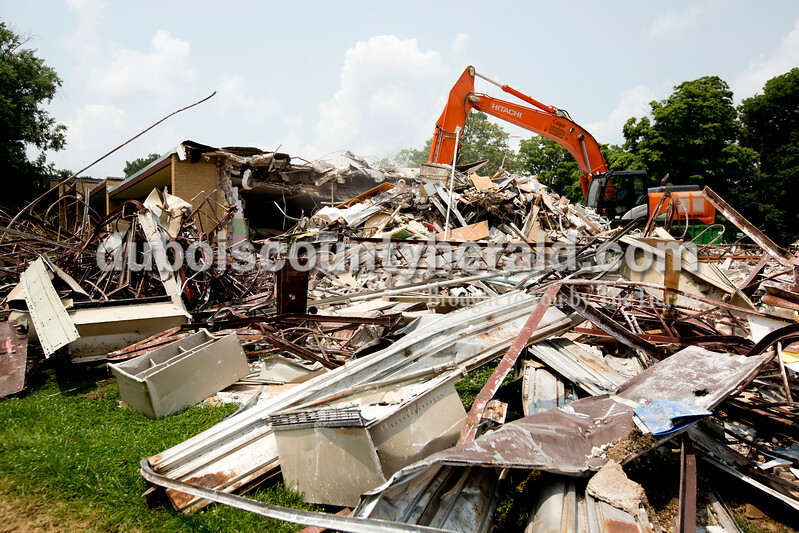 Since the beach at Patoka Lake flooded, everyone was relocated to a higher parking lot. 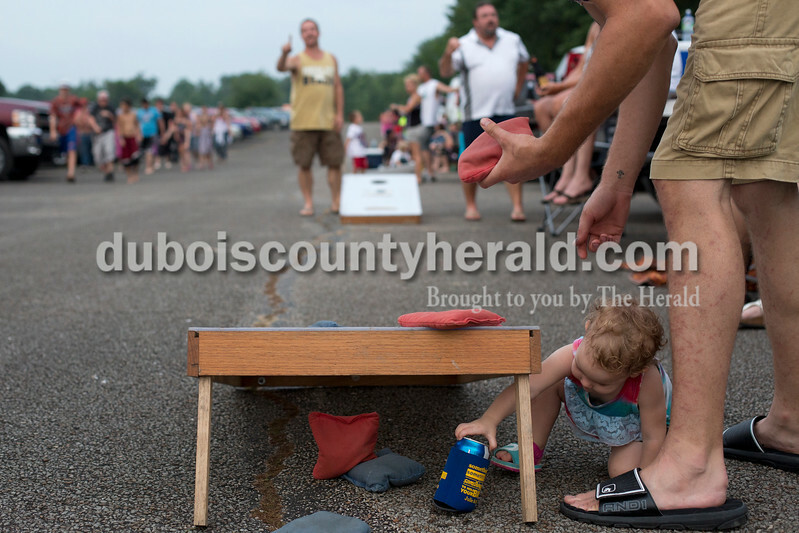 Bristol Griffith of Dubois, 1, reached for her dad's drink while he played corn hole with his friends on Saturday evening at Patoka Lake for Thunder Over Patoka. 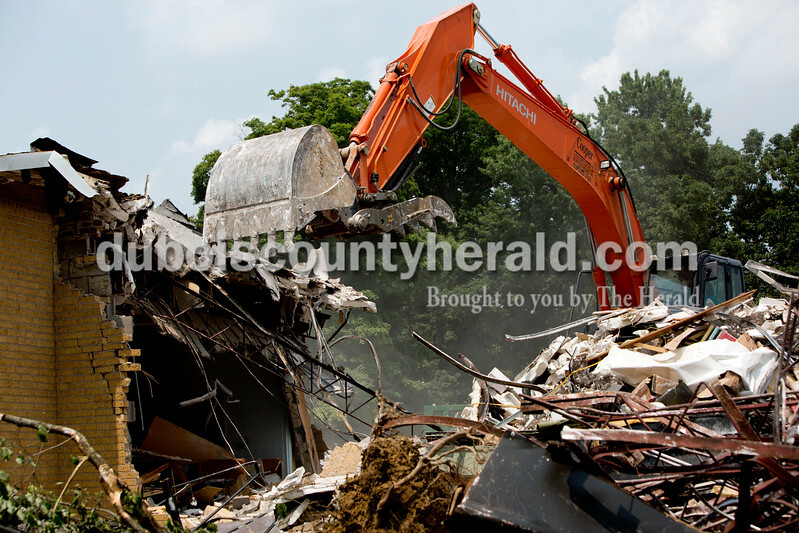 Since the beach at Patoka Lake flooded, everyone was relocated to a higher parking lot. 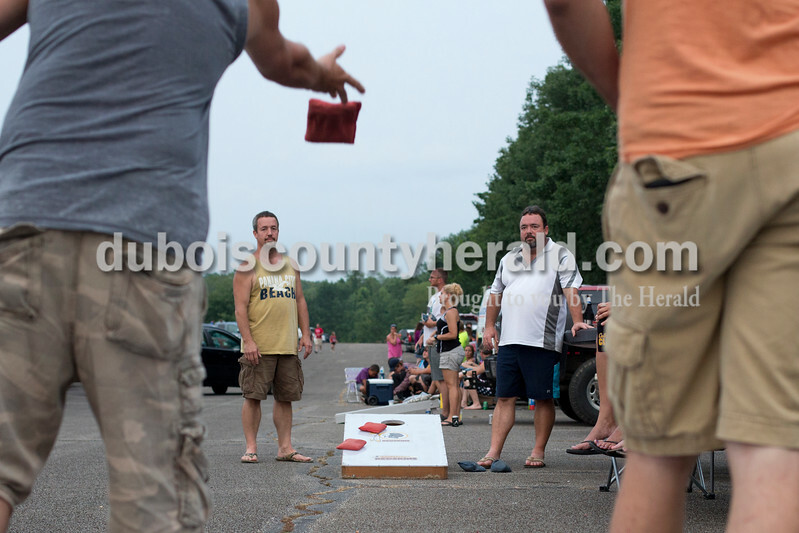 Aaron Schipp of Jasper, far left, played corn hole with friends Steve Mattingly of Lincoln City, left, Robert Mattingly of Jasper, right, and Kyle Griffith of Dubois, far right, on Saturday evening at Patoka Lake for Thunder Over Patoka. Since the beach at Patoka Lake flooded, everyone was relocated to a higher parking lot. 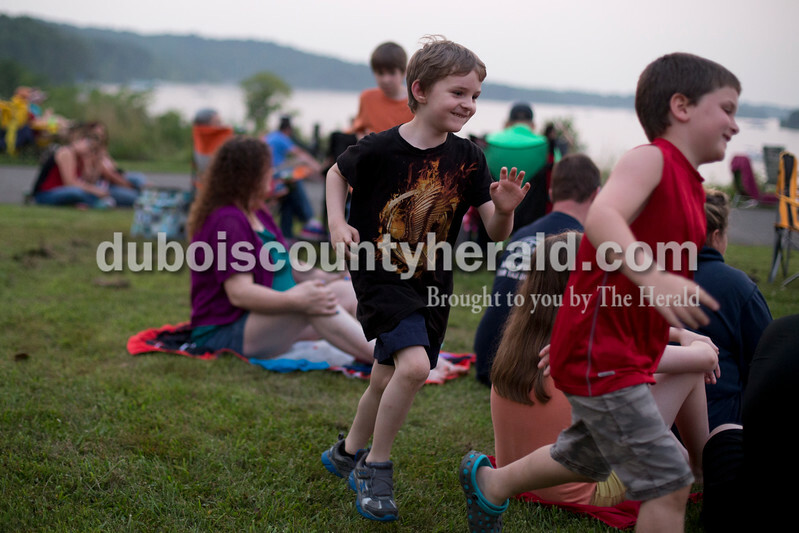 Sean Mills of Evansville, 6, left, played tag with his friend Jackson Hughes of Salem, Illinois, 7, right, and his brother Ben Mills of Evansville, 7, not pictured, on Saturday evening at Patoka Lake for Thunder over Patoka. Since the beach at Patoka Lake flooded, everyone was relocated to a higher parking lot. 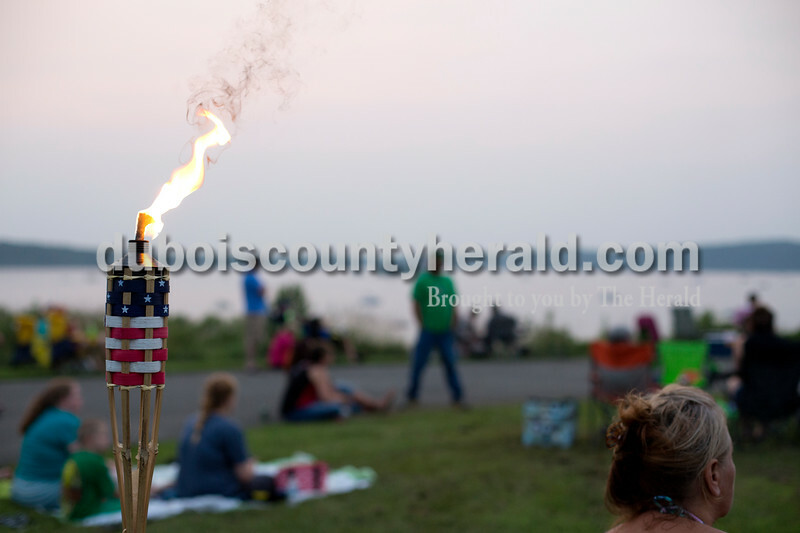 Tammy Goble of Warsaw sat near tiki torches on Saturday evening at Patoka Lake for Thunder over Patoka. Since the beach at Patoka Lake flooded, everyone was relocated to a higher parking lot. 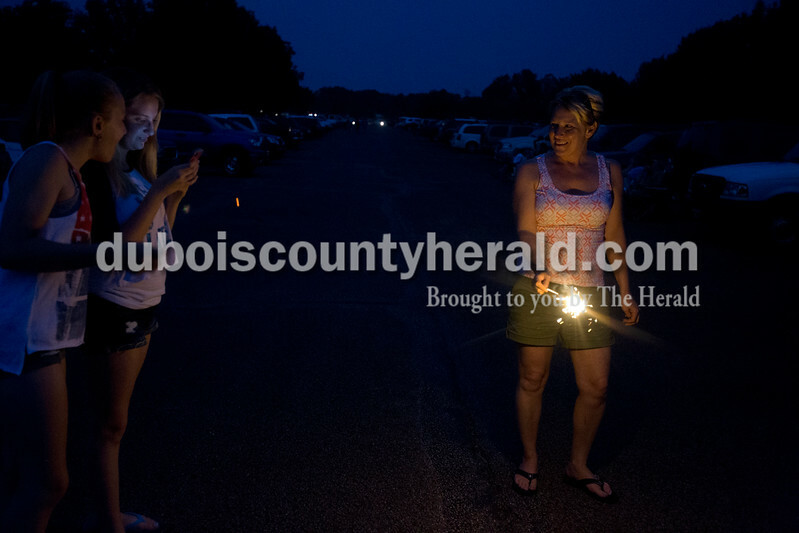 Abby Uebelhor of Jasper, 12, left, looked at pictures with her friend Kira Dewitt of Huntingburg, 12, center, taken by Dewitt's mom Staci Dewitt, right, on Saturday evening at Patoka Lake for Thunder over Patoka. Since the beach at Patoka Lake flooded, everyone was relocated to a higher parking lot. 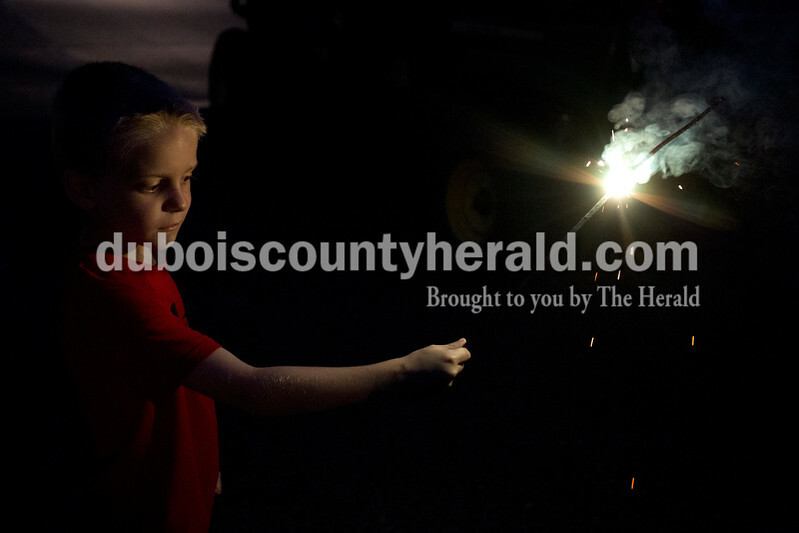 Kolten Dewitt of Huntingburg, 8, looked down with dissappointment after he was told by lake officials that fireworks were not allowed on Saturday evening at Patoka Lake for Thunder over Patoka. Since the beach at Patoka Lake flooded, everyone was relocated to a higher parking lot. 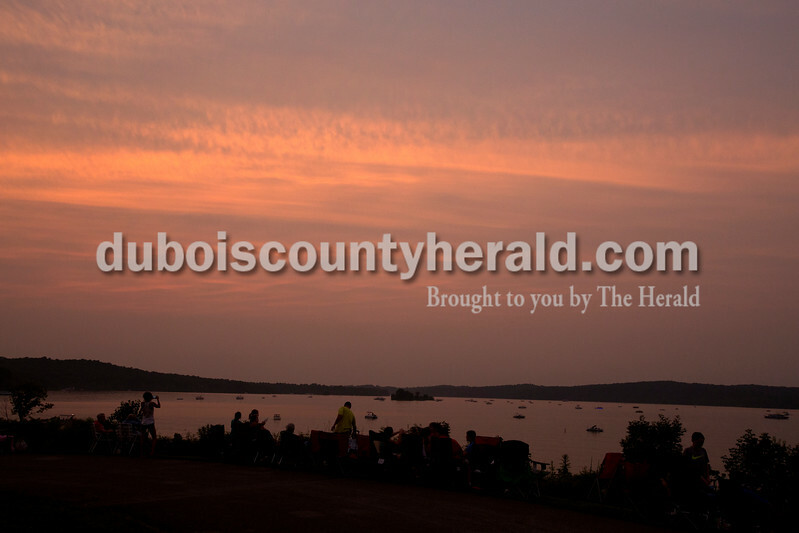 People on land and on water gathered on Saturday evening at Patoka Lake for Thunder over Patoka. Since the beach at Patoka Lake flooded, everyone was relocated to a higher parking lot. 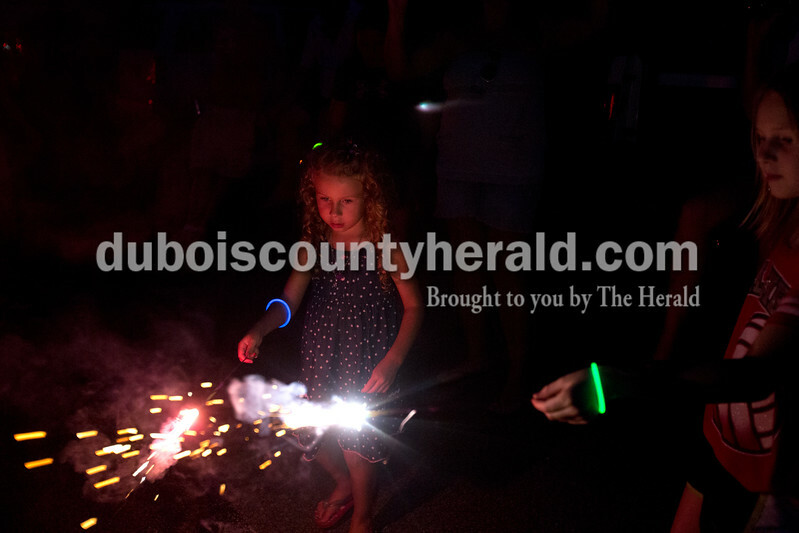 Aryssa Schip of Jasper, 5, left, and Ava Meyer of Jasper, 9, right, played with sparklers on Saturday evening at Patoka Lake for Thunder over Patoka. Since the beach at Patoka Lake flooded, everyone was relocated to a higher parking lot. 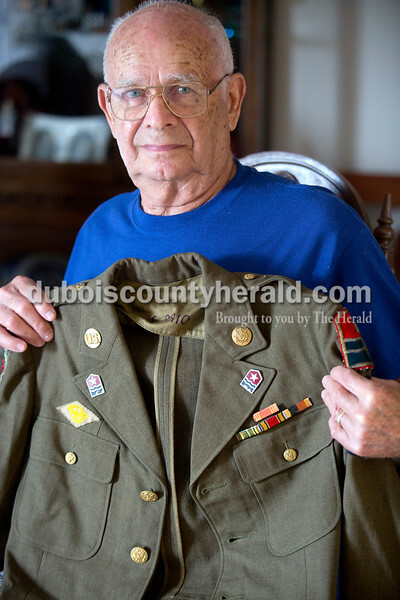 World War II veteran Otto Begle of Ferdinand held up the jacket he wore as a member of the Military Police after being drafted in the army in 1945. 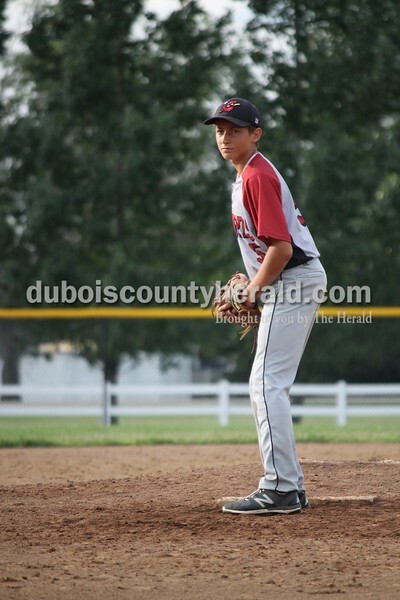 Begle said he part of the largest draft group from Dubois County with 71 others. 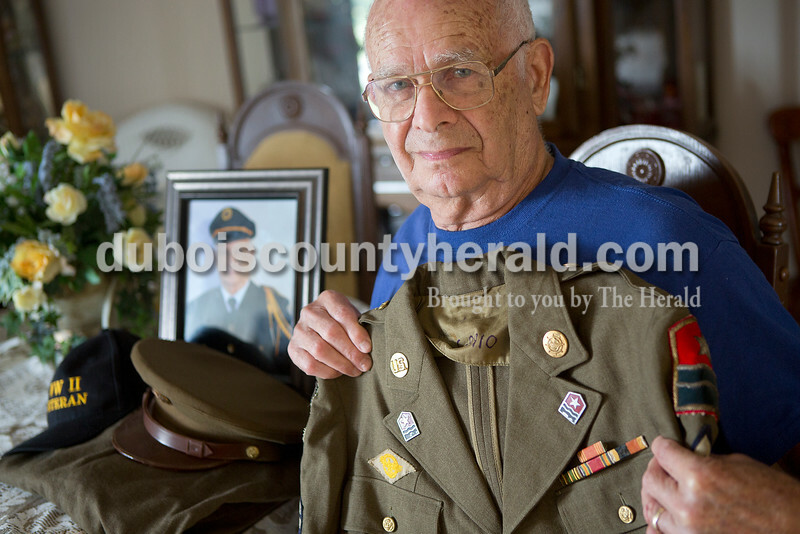 Since his service, he joined the Rifle Squad with the Ferdinand American Legion and has attended over 200 military funerals. 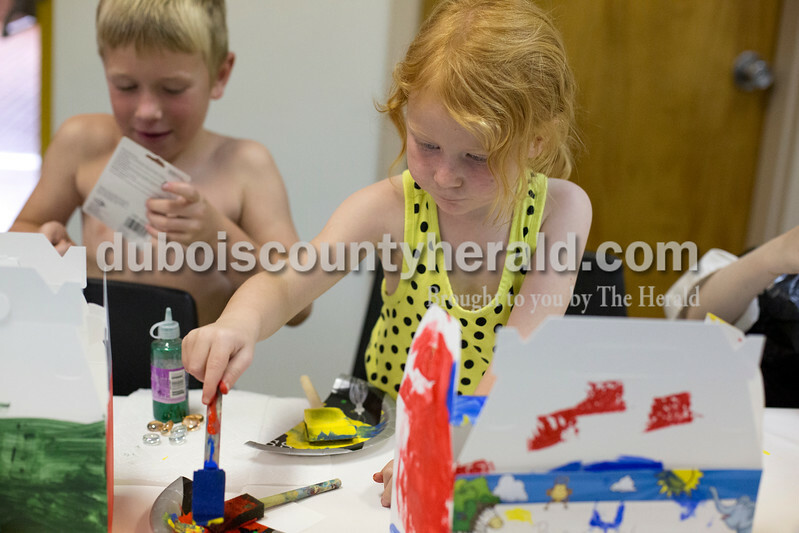 Drake Hagan of Jasper, 6, left, painted a treasure chest alongside his sister Bailey Hagan of Jasper, 3, right, on Sunday during the Patoka Lake's Pirate Day Celebration at the Patoka Lake Nature Center. These pirate activities were supposed to take place at the beach, but since it was flooded they had to relocate to the nature center. 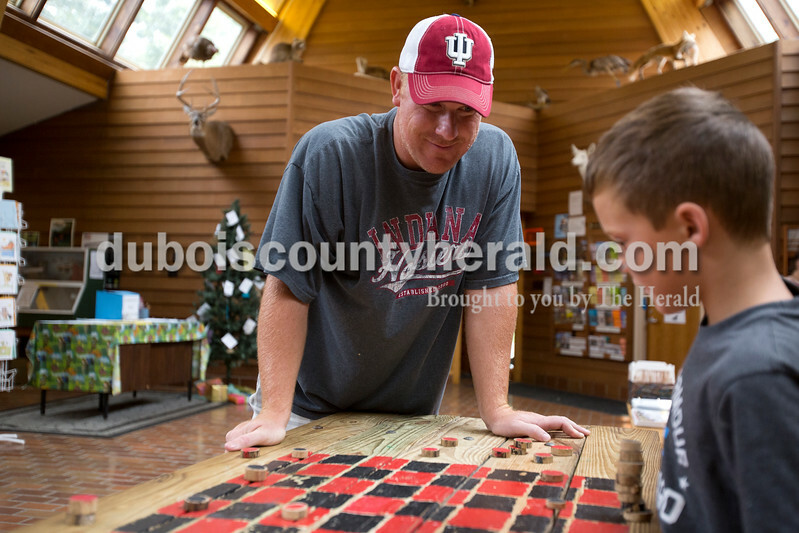 Scott Hagan of Jasper, left, played checkers with his nephew Jackson Lambert of Brownsburg, 7, right, on Sunday during the Patoka Lake's Pirate Day Celebration at the Patoka Lake Nature Center. The pirate activities were supposed to take place at the beach, but since it was flooded they had to relocate to the nature center. 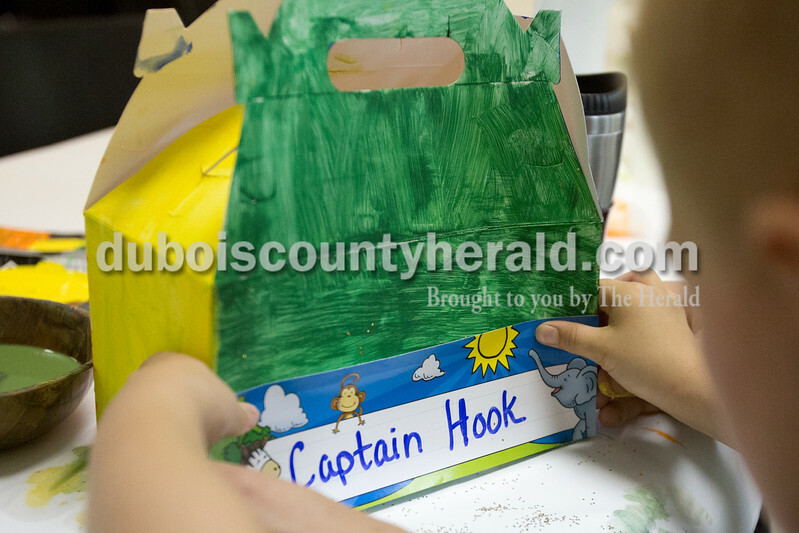 Andrew Smith of Corydon helped his son Gunner Smith of Corydon, 5, put a name tag on his painted treasure chest on Sunday during the Patoka Lake's Pirate Day Celebration at the Patoka Lake Nature Center. These pirate activities were supposed to take place at the beach, but since it was flooded they had to relocate to the nature center. 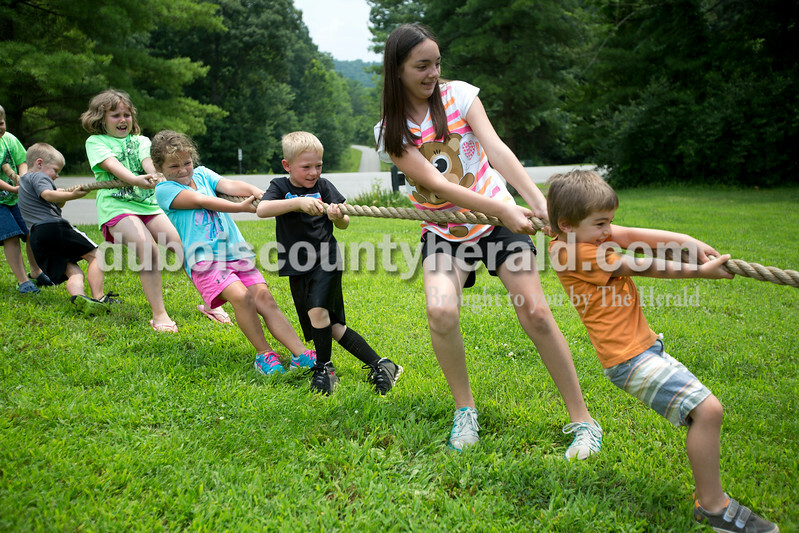 Children of all ages played a game of tug-o-war on Sunday during the Patoka Lake's Pirate Day Celebration at the Patoka Lake Nature Center. These activities were supposed to take place at the beach, but since it was flooded they had to relocate to the nature center. 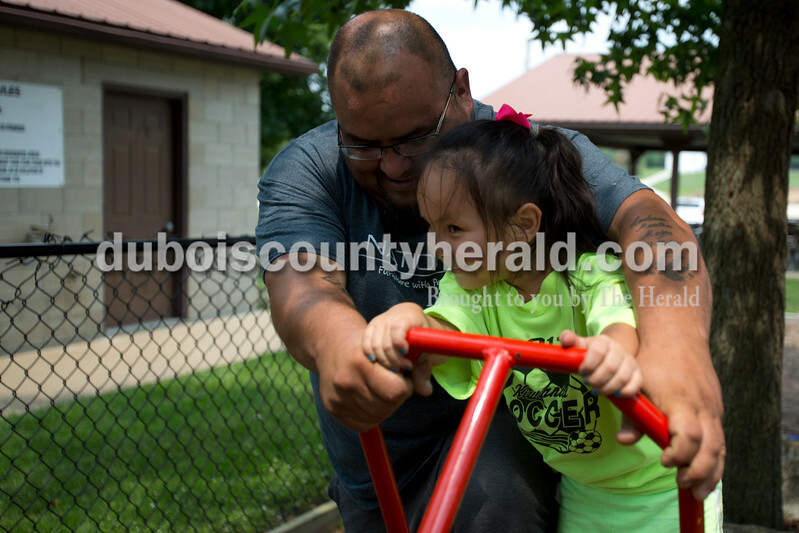 Jaime Moya of Birdseye helped his daughter Shaylee Moya of Texas, 4, play on the seesaw on Sunday at Birdseye Park. 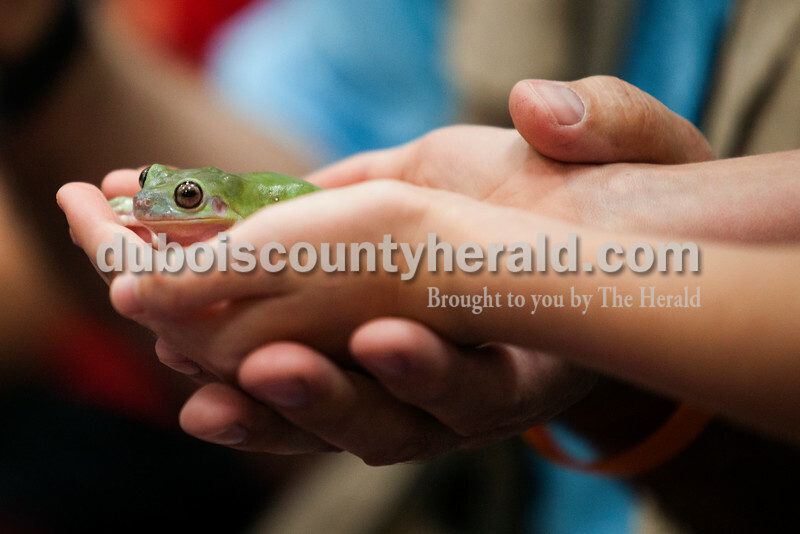 Jillian Dittelberger of Ireland, 8, held a white's tree frog during the Silly Safari event at the Jasper Public Library on Tuesday afternoon. 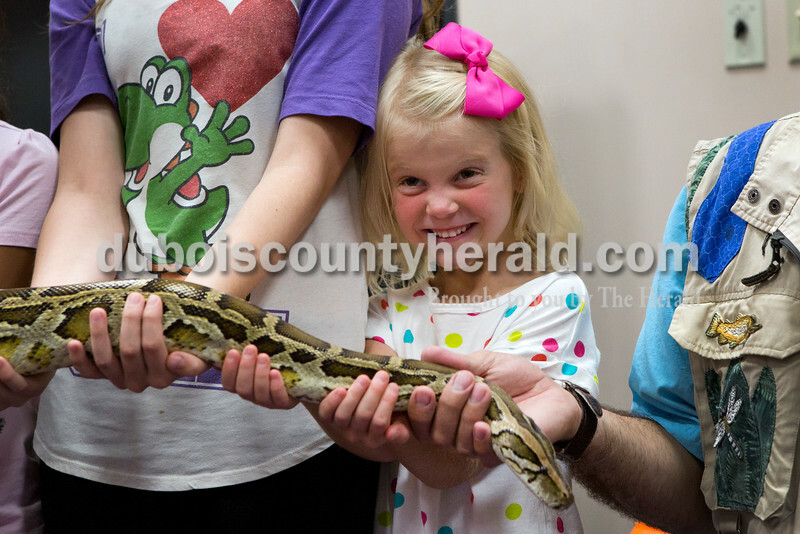 Adalyn Welp of Jasper, 5, made a face at her mother as she held a Burmese python during the Silly Safaris event on Tuesday afternoon at the Jasper Public Library. 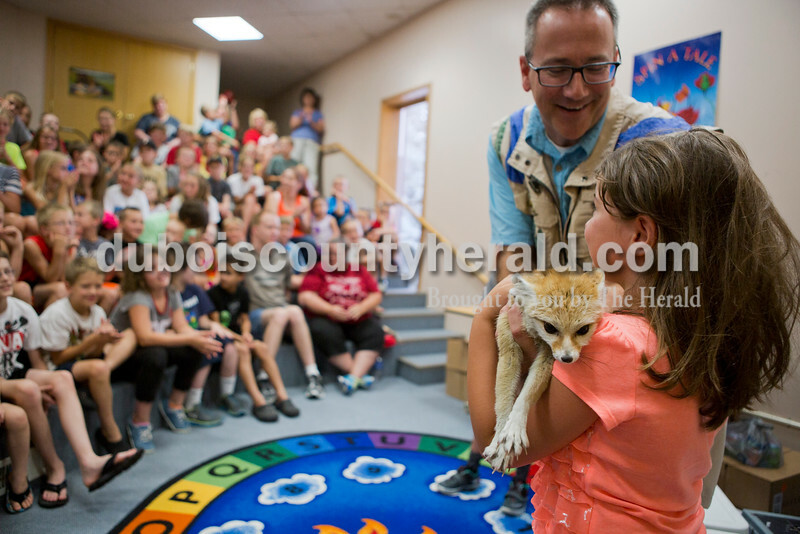 Rockne Lueken of Jasper, 10, leaned back as "Amazon John", John Cusson, showed him a bearded dragon lizard during the Silly Safaris event on Tuesday afternoon at the Jasper Public Library. 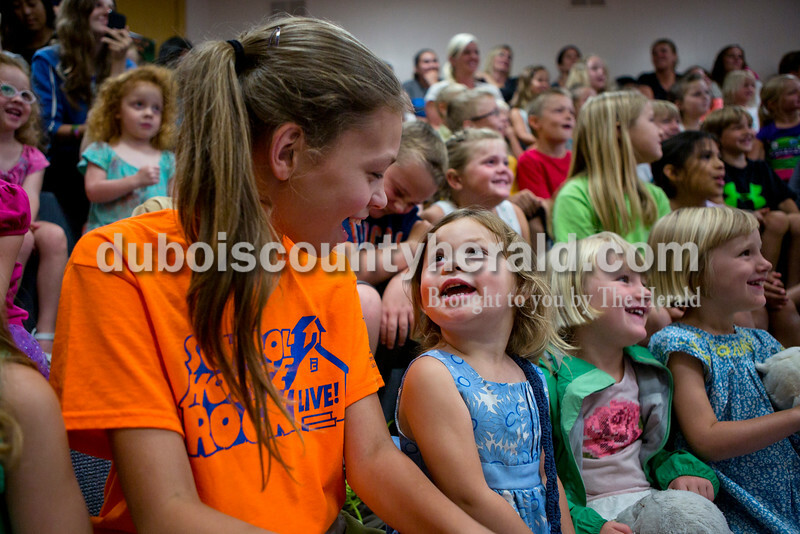 Landry Lueken, 2, looked up at her sister Faustina Lueken, 12, both of Jasper, in excitement after seeing a fennec fox at the Silly Safaris event on Tuesday afternoon at the Jasper Public Library. Katherine Trevino of Jasper, 5, held a fennec fox during the Silly Safari event on Tuesday afternoon at the Jasper Public Library. The event explored how superpowers can exist in the wild. John Cusson, "Amazon John", showed Carleigh Price, 3, and her mother Amy, both of Huntingburg, a thin tendril of webbing from a tarantula during the Silly Safaris event on Tuesday afternoon at the Jasper Public Library. Children gathered at the front of the library theatre with John Cusson, "Amazon John", to hold a Burmese python during the Silly Safaris workshop on Tuesday afternoon at the Jasper Public Library. It took eight children to hold the 10-foot long snake. 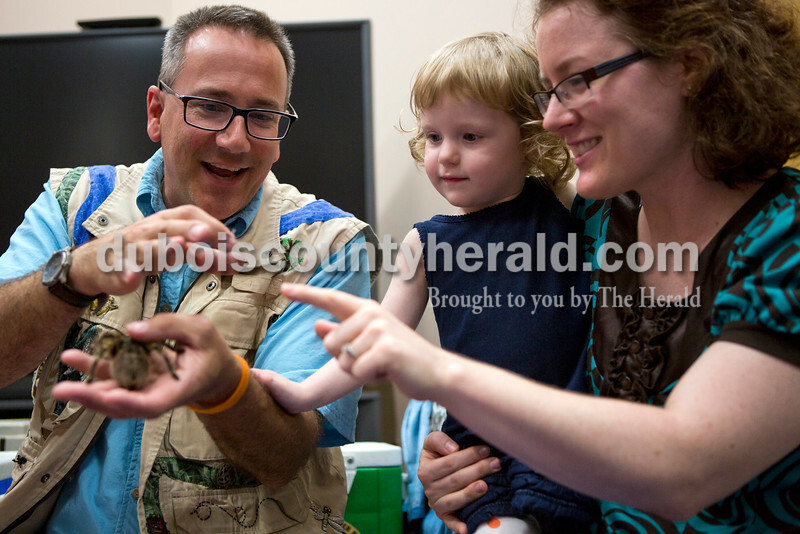 Madelyn Day of Jasper, 9, held her arms up in excitement as she saw "Amazon John", John Cusson, reveal a tarantula during the Silly Safaris workshop on Tuesday afternoon at the Jasper Public Library. 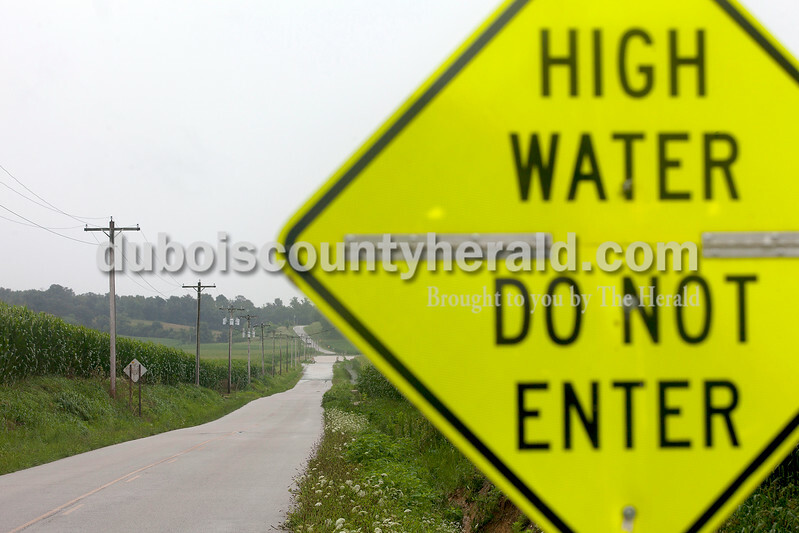 On Tuesday, near the intersection of Sunset Drive and 200W in Huntingburg there were flooded roads that many vehicles were stranded on throughout the day. Emergency responders responded to the multiple calls from the owners of these stranded vehicles. Bob Hochstetler of Jasper seached the bookshelves for a Cajun cookbook on Tuesday afternoon at the Jasper Public Library. 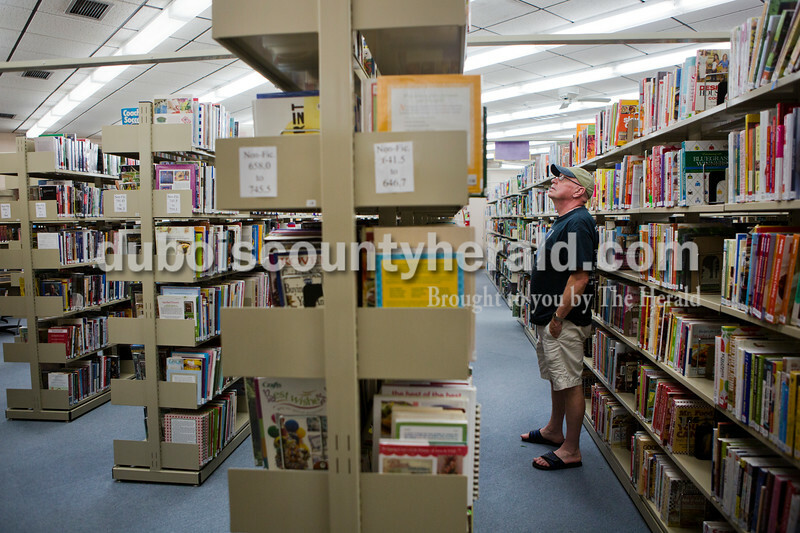 "This is really a small library for a town this size," said Hochstetler. 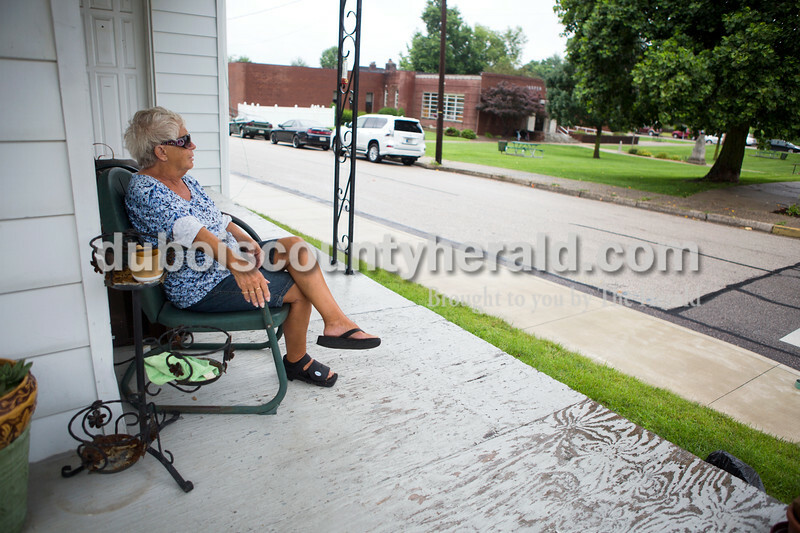 Katie Sears of Jasper sat on her porch across from the Jasper Public Library on Tuesday afternoon. 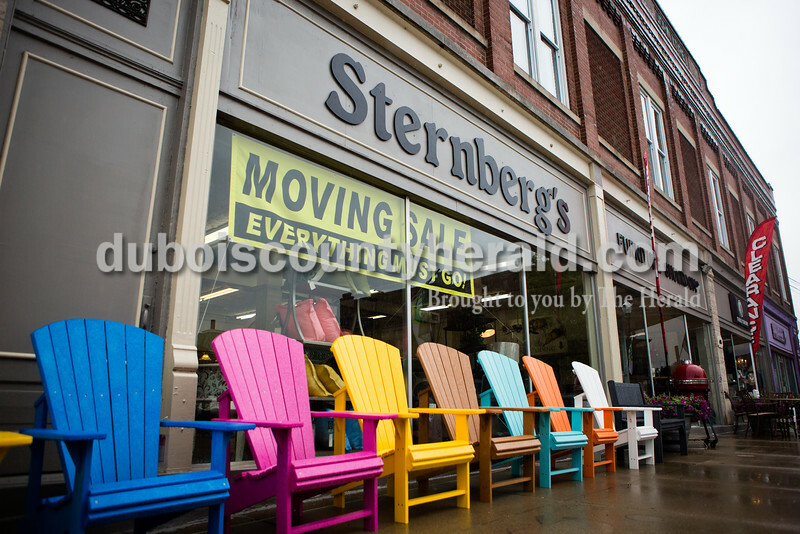 "I come out here everyday, unless it's so cold I can't be outside," said Sears. 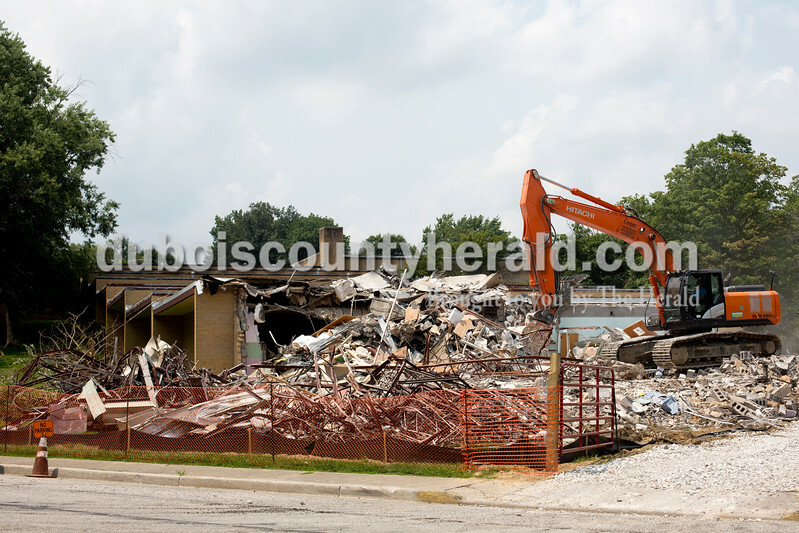 The former Maple Park School in Huntingburg, photographed on Monday, is in the process of being demolished by Huntingburg-based Cooper Rail Service, Inc.
Joe Songer, right, chatted with Keith Horton, both of Huntingburg, before open mic night at the Gaslight in Huntingburg on Thursday. The Gaslight will be celebrating its 45th anniversary this Friday. 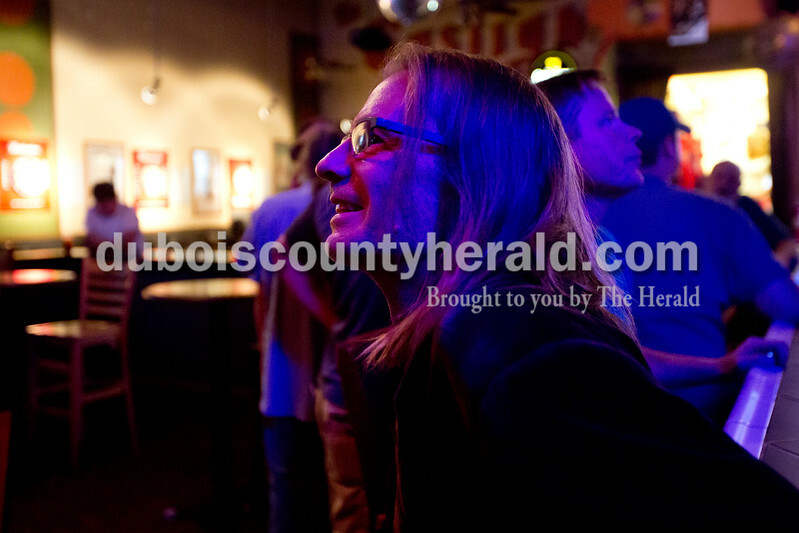 Brian Borman of Huntingburg listened to the performance by Sparrow and Crandall at open mic night at the Gaslight in Huntingburg on Thursday. The Gaslight will be celebrating its 45th anniversary this Friday. 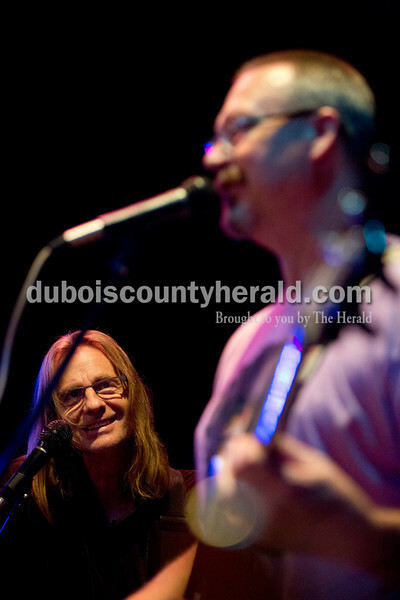 Borman played bass later in the night. 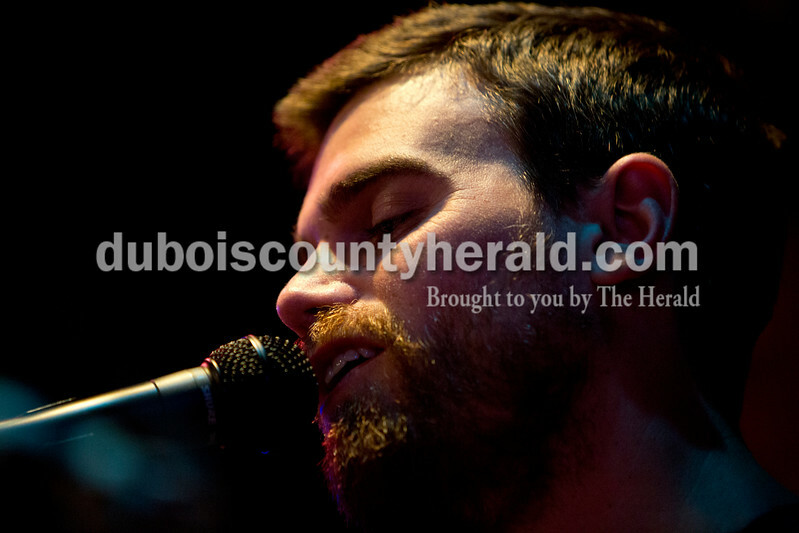 Steven Wagler of Jasper sang while performing at open mic night at the Gaslight in Huntingburg on Thursday. The Gaslight will be celebrating its 45th anniversary this Friday. 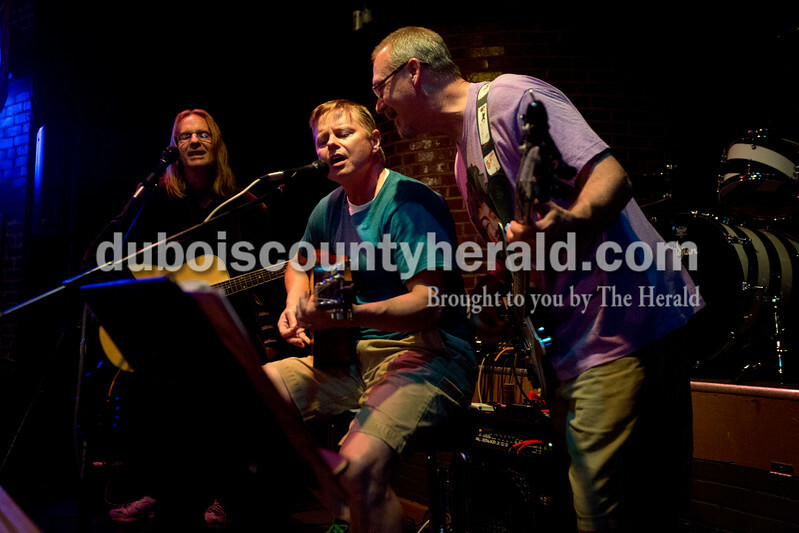 Brian Borman of Huntingburg, left, Chris Nelson of Jasper and Mark Sparrow of Ireland performed together at open mic night at the Gaslight in Huntingburg on Thursday. The Gaslight will be celebrating its 45th anniversary this Friday. 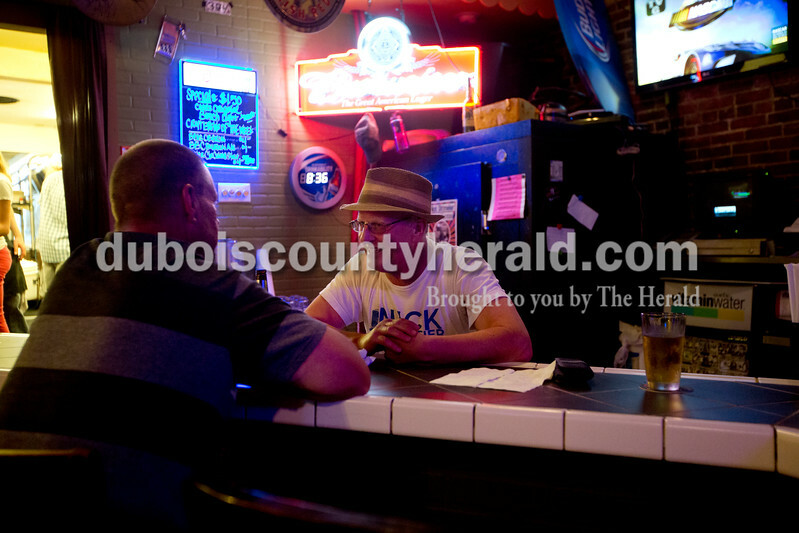 Brian Borman of Huntingburg, left, and Mark Sparrow of Ireland performed at open mic night at the Gaslight in Huntingburg on Thursday. The Gaslight will be celebrating its 45th anniversary this Friday. 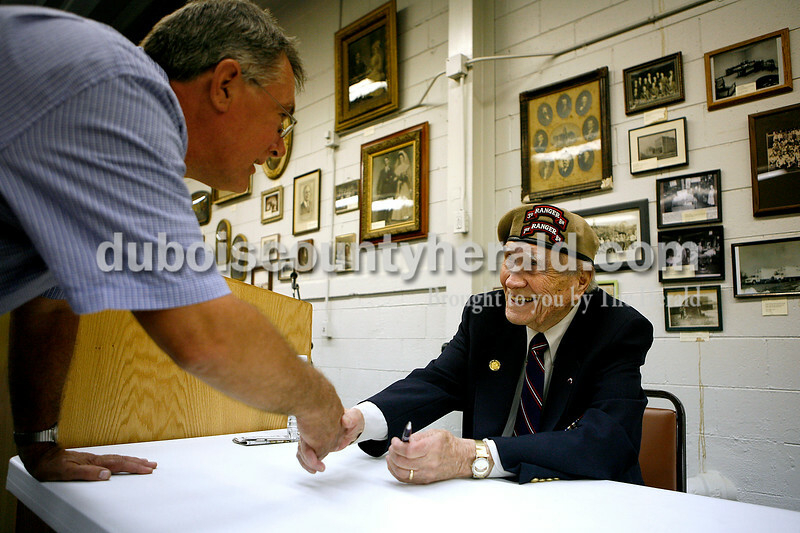 World War II veteran Warren Evans, 90, signed autographs and shook hands following his speech at the Dubois County Museum in 2008. Evans, of Huntingburg, was captured and escaped three times during the war. 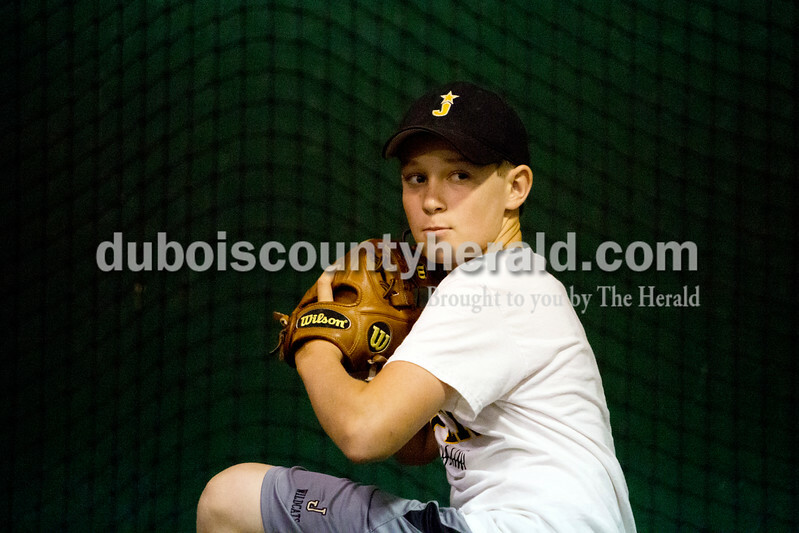 Grant Ahlbrand of Jasper, 14, wound up to pitch during baseball practice at the field house at Ruxer Field in Jasper on Thursday evening. 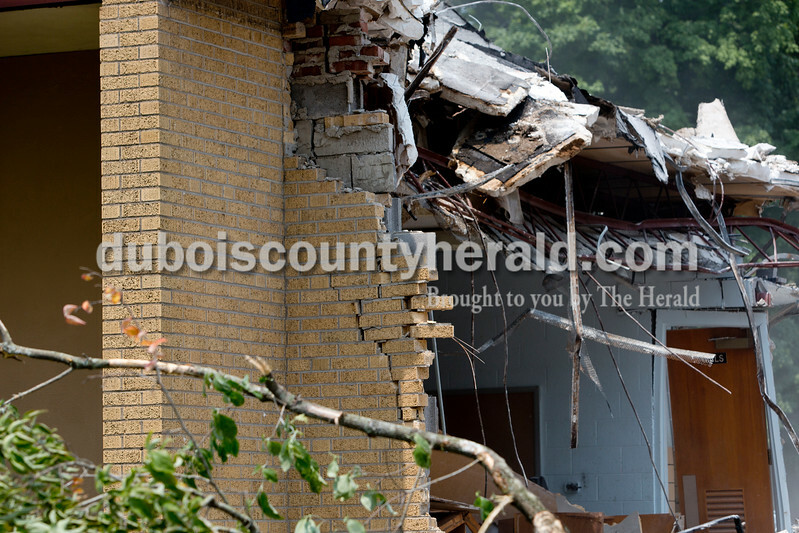 Sara and Brian Betz of Schnellville. Rachel and Brett Giesler of Ferdinand. 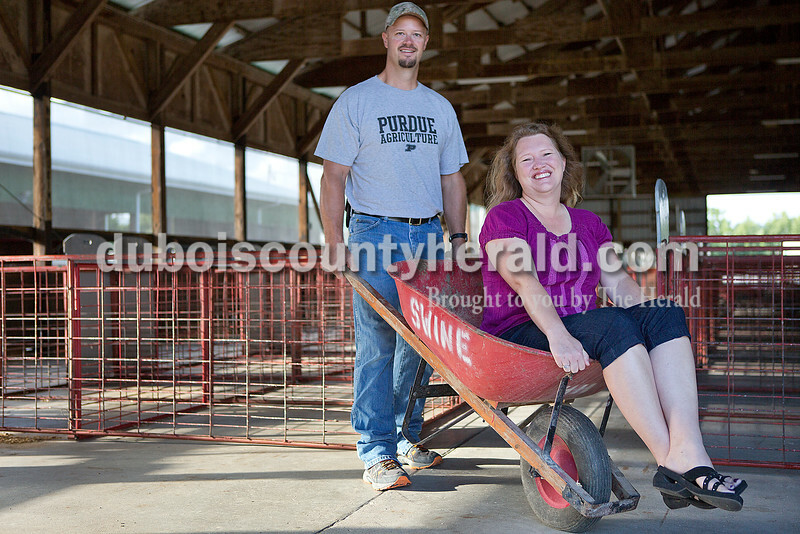 Daryl and Jennifer Kluemper of Jasper.